Lolth, the Spider Queen and chief among drow deities, would have her followers believe that she and she alone is the source of divine patronage for the race of dark elves. Despite her jealousy and her reticence, other drow deities do exist and frequently attract converts from the ranks of the dark elves. One such deity is Vhaeraun, the Masked Lord. Son of Lolth and Corellon Larethian, the drow god of thievery seeks to depose his mother and return the drow to the surface world, which the dark elves call the Night Above. His message of equality for the sexes and reconquest of the surface world has attracted many drow to his cause -- particularly drow males. Alak Abaeir is one such convert. As the son of a drow noble house, Alak could look forward to receiving very little of anything from life. Throughout his childhood, he was drilled in the rigorous hierarchy of dark elf society, as all drow children are. He was constantly reminded of his inferior position, and he never looked a ranking house member in the eye for fear of grave punishment. Also, the presence of the female clerics of Lolth reminded him of his role. These clerics remained arrogant and secure in the power granted to them by the Spider Queen. Many times during his youth, Alak watched a powerful female cleric take a male consort only to discard the battered and used up body of that consort weeks if not days later. He, like all other drow males it seemed, could not escape the constant oppression and degradation and could, at best, hope to be favored by a wife with a relatively kind disposition. This was not enough for Alak. Knowing that there must be a way to escape from the clutches of the Spider Queen, he turned his keen mind to thoughts of treachery and revenge. Knowing that he could never oppose the ruling clerics directly, he learned how to fight from the shadows. He taught himself how to escape their notice -- even when standing in plain sight. He learned to render himself so nondescript and unremarkable that those other dark elves who stood in his presence would not remember his face an hour after he has left. The Masked Lord took notice of Alak's growing talent for stealth and deception and dispatched a group of clerics to recruit the young drow into his service. When these clerics revealed Vhaeraun's agenda to Alak and described the role the Mask Lord envisioned for his talented new follower, the young drow enthusiastically entered into the ranks of Vhaeraun's devoted. As his first task, Vhaeraun dispatched the young assassin to remove a particularly troublesome matron mother, who was coming too close to exposing the Masked Lord's hidden opposition to Lolth. Alak eliminated the threat cleanly and efficiently. He framed a rival house for the matron's death, touching off a wave of retributive assassinations that conveniently took the lives of several other enemies of the Masked Lord. Since then, Alak has been the tool of the Masked Lord. He works in shadows to destroy those who would oppose Vhaeraun's agenda. One day, Alak knows, the female clerics of Lolth will finally be toppled from power. Then, at last, he will leave the shadows behind and take part in a new drow society in the reclaimed Night Above as a full and equal citizen. 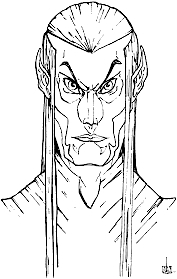 Alak Abaeir: Male drow Rog7/Wiz6; CR 13; Medium-size humanoid (elf); HD 7d6+14 plus 6d6+12; hp 68; Init +5; Spd 30 ft.; AC 20, touch 18, flat-footed 20; Atk +8/+3 melee (1d4+3/19-20, assassin's dagger), or +15/+10 melee (1d6+2/18-20, +1 rapier), or +10/+5 melee (1d6+1 subdual, sap); SA death attack, sneak attack +7d6, spell-like abilities; SQ darkvision 120 ft., drow traits, evasion, poison use, saving throw bonus against poison +3, SR 24, traps, uncanny dodge (Dex bonus to AC, can't be flanked, +2 against traps); AL NE; SV Fort +6, Ref +15, Will +4; Str 12, Dex 21, Con 14, Int 16, Wis 11, Cha 10. Skills and Feats: Balance +19, Climb +15, Disable Device +17, Disguise +14, Escape Artist +19, Gather Information +14, Hide +25, Jump +3, Listen +2, Move Silently +25, Open Lock +19, Search +15, Spot +2, Tumble +19; Dodge, Scribe Scroll, Skill Focus (Hide), Skill Focus (Move Silently), Stealthy, Weapon Finesse (rapier). Death Attack: If Alak studies his victim for 3 rounds and then makes a sneak attack roll with a melee weapon that successfully deals damage, Alak may also choose to paralyze or kill the target, if the target fails its Fortitude saving throw against DC 20 (assassin's dagger). If the saving throw fails against the paralysis attack, the target is completely helpless for 1d6+6 rounds. If the saving throw fails against the death attack, the target is dead. Spell-Like Abilities: 1/day -- dancing lights, darkness, faerie fire. Caster level 13th; save DC 10 + spell level. Drow Traits: Alak is immune to magic sleep spells and effects. He has a +2 racial bonus on saves against enchantment spells or effects and a +2 racial bonus on Will saves against spells or spell-like abilities. He is entitled to a Search check when within 5 feet of a secret or concealed door as though actively looking for it. As a drow, Alak has light blindness (blinded for 1 round by abrupt exposure to bright light, -1 circumstance penalty on all attack rolls, saves, and checks while operating in bright light). He also has a +2 racial bonus on Listen, Spot, and Search checks (already figured into the statistics given above). Evasion (Ex): If exposed to any effect that normally allows a character to attempt a Reflex saving throw for half damage, he takes no damage with a successful saving throw. Poison Use: Alak is trained in the use of poisons and never risks poisoning himself when applying poison to a blade. Saving Throw Bonus against Poison: Alak receives a +3 bonus to resist the effect of poisons. Spells Prepared (4/2/2/2; save DC 13 + spell level): 1st -- change self (2); 2nd -- pass without trace (2); 3rd -- nondetection (2). Spellbook: 1st -- change self, obscuring mist, spider climb; 2nd -- darkness, pass without trace; 3rd -- invisibility, nondetection.